Would You Like to Host a Trash Fashion Show or Make Trash Fashion? 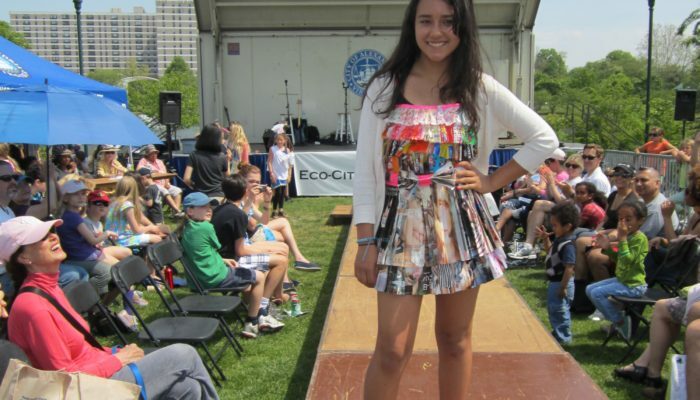 Did you know trash fashion shows can be a fundraiser? If you volunteer at a school or community organization, this could be a great way to connect with creative people while raising money. 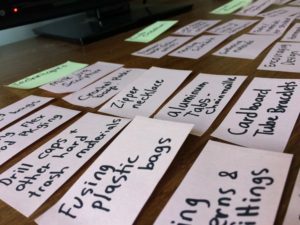 I drafted outlines for two online courses – one for designers and one for community builders. I would like to interview you to find out what you would love to see in these courses. Whether you want to make trash fashion designs, or you want to host a trash fashion show as a way to build your community – I would love to interview you. Just let me know at trashmagination@gmail.com! You don’t need to know anything about trash fashion. I just want to hear what you would expect in such a course, or why you think you’d take the course. I can interview people all over the world via Skype. I am also interested in hosting test classes in my home in Reston, Virginia with 4-5 teens and adults in 2018. For more info about this idea, listen to the podcast! And please share this idea with any friends who might benefit. Also, you would probably enjoy the Trashmagination podcast episode on trash fashion! Do You Know People In These Roles? Teachers – Trash fashion is an obvious choice for an art or fashion teacher. Materials are free so they might not have to dig into their supply budgets to do the project. However, it could also be a great project for a science teacher who wants to teach about manipulating materials or sustainability. It could be a math teacher who wants to teach about measuring and calculating sizes. It could be a marketing teacher who wants to teach how to develop a product and market an event. I’m hoping I can talk with teachers who teach at various age levels because the event is very different when done with elementary school students as compared to middle or high school students or adults. Counselors or Youth Leaders – I’m thinking about people who run after-school programs who would imagine a trash fashion show as a long-term project for the kids. For example, I attended a trash fashion show put on by a local Boys and Girls Club in Manassas, Virginia. They partnered with a local secondhand shop to provide some of the materials. It could be an idea for a Girl Scout or Boy Scout leader. For example, Scouts already have events like the Pinewood Derby. How about an event that teaches other hands-on skills? Sewists, Quilters, Crochet Artists or Fashion Designers – If you love sewing and would love to find a way to volunteer, I bet a trash fashion show would be a great energizing volunteer opportunity. People who Run Art Programs at Universities or Cosmetology or Hair Schools – The Junk Kouture trash fashion program in Ireland partners with local art schools to offer scholarships to winners. Cosmetology and hair programs offer specialized awards in those categories. What a great way to connect with potential students for your programs! Art Gallery Owners – An art gallery could bring a lot of people in the door by hosting a trash fashion show! Waste Management Professionals – I’m thinking about people who do community outreach for waste management companies. This could be people in municipal or state government who want to engage students in ways to creatively reuse trash. Thrift or Creative Reuse Store Owners – I mentioned that the Boys & Girls Club who held a trash fashion show were sponsored by a local thrift store. I would think a trash fashion show could be a great event for such a store for community engagement. The City of Orlando has hosted an event for five years called Trash2Trends. In one year, it raised $22,000 to help with recycling programs through ticket sales and corporate sponsorships. A school in Bend, Oregon raised $24,000 at their event, Rubbish Renewed. At that event, there was a live auction where people could bid on some of the designs and take them home. In Ireland, a program called Junk Couture offers hefty scholarships. Their big final show is taking place this week on April 19, 2018 in Dublin and I would LOVE to be there. The entries in that show definitely used the most unusual materials I have ever seen, probably because using unusual materials is one criteria in the scoring. Aveda sponsors trash fashion shows called Catwalks for Water through Aveda salons around the world, and the trash fashion designers can win scholarships.